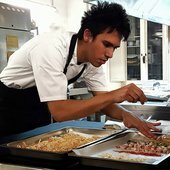 Voted one of the 10 Best Young Chefs in Scandinavia, talented Mexican Santiago Lastra began his career at Spanish restaurant Mugaritz, before joining the team at Bror in Copenhagen. Other stopovers include the Nordic Food Lab, the Wood*ing Foraging Academy and, most recently, NOMA Mexico – where he worked with Danish chef René Redzepi. Santiago's dishes are inspired by fresh local ingredients but rooted in his own Mexican heritage, with texture, colour and soul at the heart of his cooking. Find out more about Carousel.